Buckle is removable. Extra stones included. 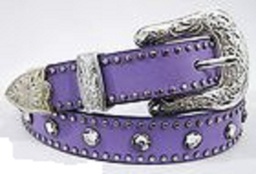 This 1.5" W gorgeous belt alternates its colors in the light (bronze & gold). 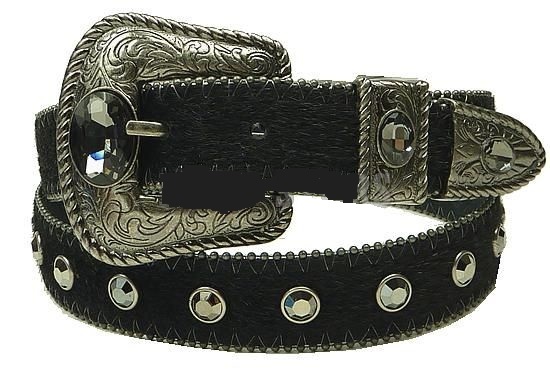 Hematite stones are embedded throughout its length and the buckle. 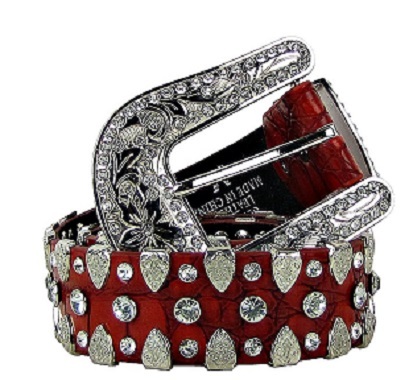 Gorgeous genuine leather belt is covered with high-quality rhinestones, including the buckle, keeper and tip. 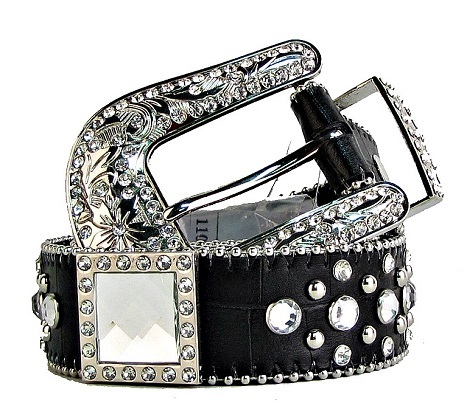 This gorgeous black leather belt features large sparkling clear rhinestones and multiple round chrome studs. 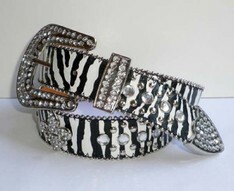 The belt is 1.5" in width and buckle is removable and includes rhinestones as well. Extra stones included. Measuring from the fold of the strap to first & last holes: 29"- 33"
Measuring from the fold of the stap to first & last holes: 27 3/4"- 31 3/4"
You are looking at on one of the highest quality hand made Designer leather belts made today. No this item is not a mass produced belt made by some big name designer in NY making his products in China. 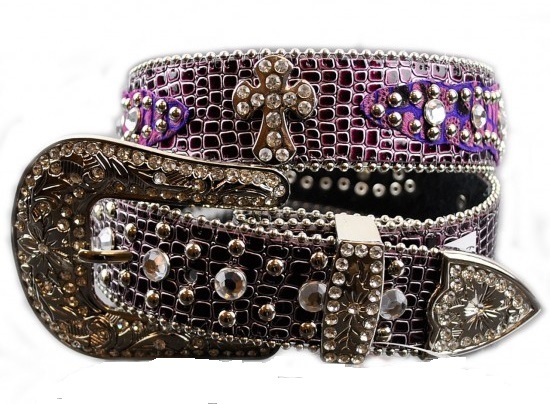 This belt is hand crafted by MadcoW & takes approx 2 days to build & paint from start to finish. MadcoW only produce unique leather goods of the very highest caliber and this belt is of no exception. All of our items are limited strictly to just 250 pieces, and then they are retired forever and replaced with a new style. This particular one is the only one in excistance at this item at this time If you are looking for a quality hand painted leather belt that is not mass produced will be far beyond your expectations, then this belt is for you. 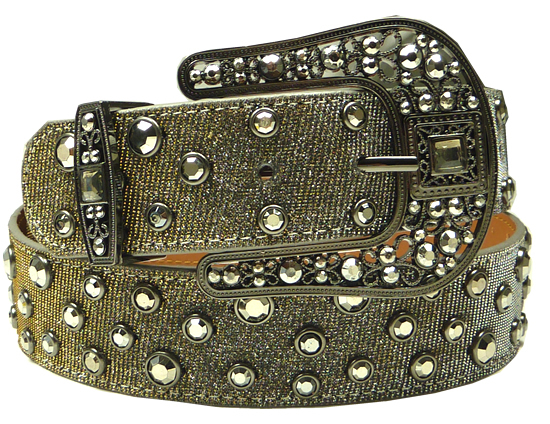 This belt has a unbelievable meticulous attention to detail which can only truly be appreciated once seen in person. The leather is among some of the highest quality around and I guarantee it is among the most supple you will ever feel! Everything about this belt screams that it is a High end designer boutique 5th ave caliber quality, everything except the price! Trust me you will not believe the quality till you feel and see it for yourself! 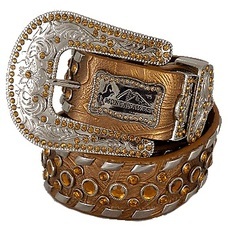 The buckle and end tip are all hand painted cream enamel in-layed with Amber Rhinestones. MadcoW only produce unique leather goods of the very highest caliber and this belt is of no exception. All of our items are limited strictly to just 250 pieces, and then they are retired forever and replaced with a new style. If you are looking for a quality hand painted leather belt that is not mass produced will be far beyond your expectations, then this belt is for you. 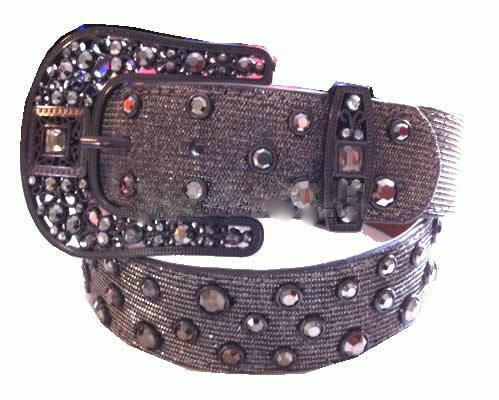 Everything about this belt screams that it is a High end designer boutique 5th ave caliber quality, everything except the price! Trust me you will not believe the quality till you feel and see it for yourself!